YEKATERINBURG: Substitute Keisuke Honda equalised with 12 minutes left as Japan twice pegged back Senegal in a thrilling 2-2 draw on Sunday that leaves World Cup Group H wide open. All eyes will now be on the other group match later in the evening between Poland and Colombia following this stalemate at the Yekaterinburg Arena. As it stands, Japan and Senegal have four points after two games, with Colombia and Poland on zero, though they have played a game less. 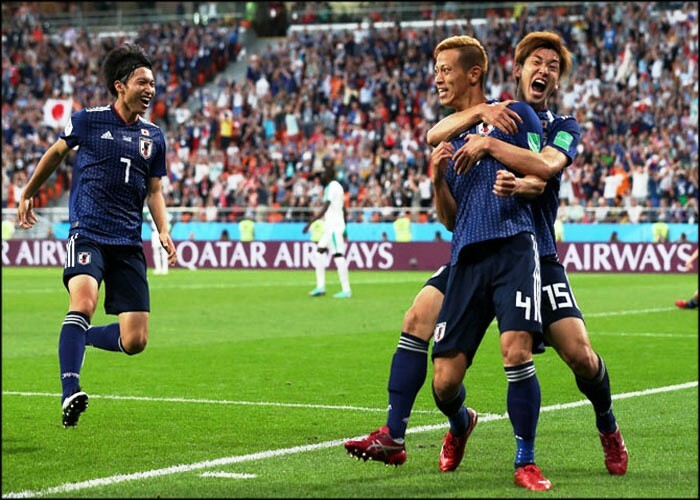 Midfielder Honda was the hero for Japan, scoring the deserved leveller after goalkeeper Khadim N’Diaye flapped at a cross. Senegal, who reached the quarter-finals in the country’s previous World Cup appearance in 2002, needed just over 10 minutes to go in front. Japan failed to deal with a right-wing cross with Genki Haraguchi nodding the ball straight to Senegal defender Youssouf Sabaly in the box. He fired at Eiji Kawashima and the goalkeeper made a mess of it, punching the ball into the lurking Liverpool star Sadio Mane. The ball bounced off the striker and into the net for his first goal at this tournament — cue raucous Senegal celebrations with Khadim N’Diaye racing the length of the pitch to join in. This match was billed as the pace and power of Senegal against the tactical and technical nous of Japan, who took a gamble and replaced Vahid Halilhodzic with Akira Nishino as coach just weeks before the World Cup. Backed by a vocal Japanese following who never stopped singing and with the locals also on their side, Japan were now the better side after a nervous start. Mane found himself at left-back at one point as the Blue Samurai threatened to slice their way through, in what was growing to be an absorbing contest in the warm Yekaterinburg evening. Aliou Cisse, Senegal’s likeable coach and their skipper in that World Cup run in 2002, sent his substitutes to warm up five minutes into the second period as Japan began the half the better. Working down the Africans’ left side, the 26-year-old talisman Mane was only a sporadic danger. Japan should have taken the lead on the hour but Yuya Osako, the match-winner against Colombia, somehow missed the ball when unmarked inside Senegal’s six-yard box. Inui then struck the bar from distance after the Senegal defence went AWOL. On 71 minutes, Japan allowed a scuffed cross to go right across their goal and defender Moussa Wague arrived all alone at the far post to grab what looked like being an unlikely winner. But Honda, the former AC Milan midfielder who had only been on the pitch six minutes, hit the late equaliser to leave Group H up for grabs.